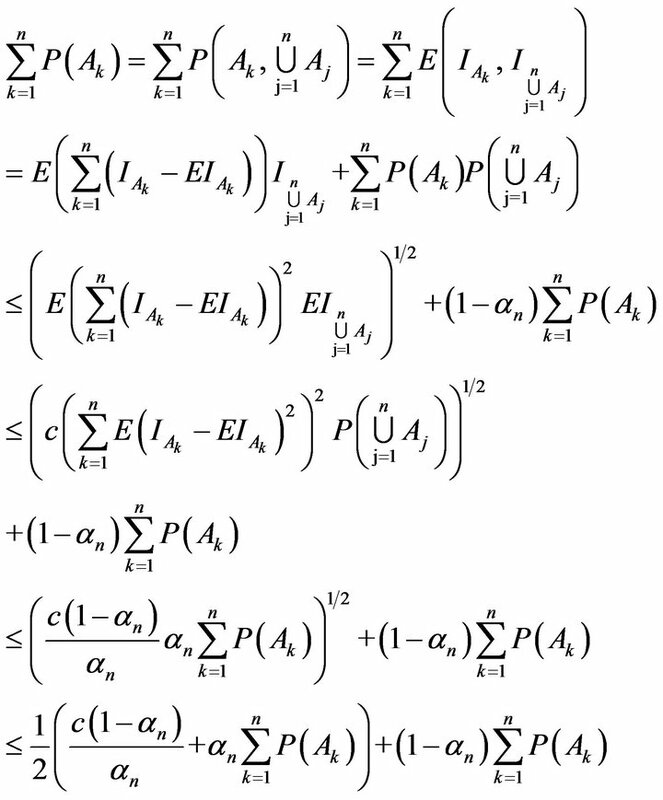 In this paper, the complete convergence and weak law of large numbers are established for -mixing sequences of random variables. Our results extend and improve the Baum and Katz complete convergence theorem and the classical weak law of large numbers, etc. 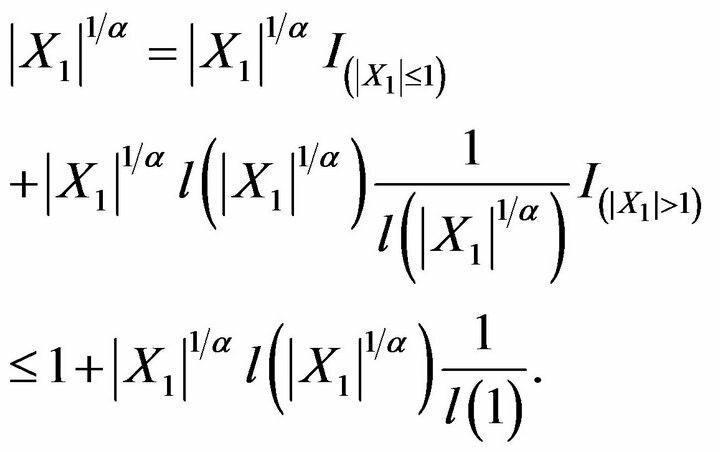 from independent sequences of random variables to -mixing sequences of random variables without necessarily adding any extra conditions. 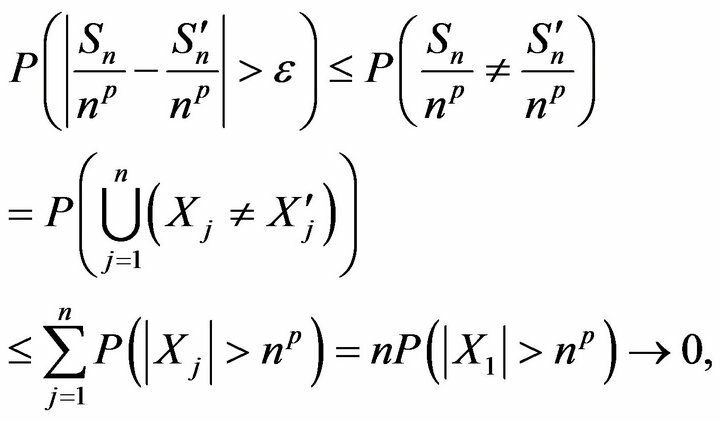 where (for a given positive integer ) this sup is taken over all pairs of nonempty finite subsets such that dist . Obviously and except in the trivial case where all of the random variables are degenerate. Definition 1.1. 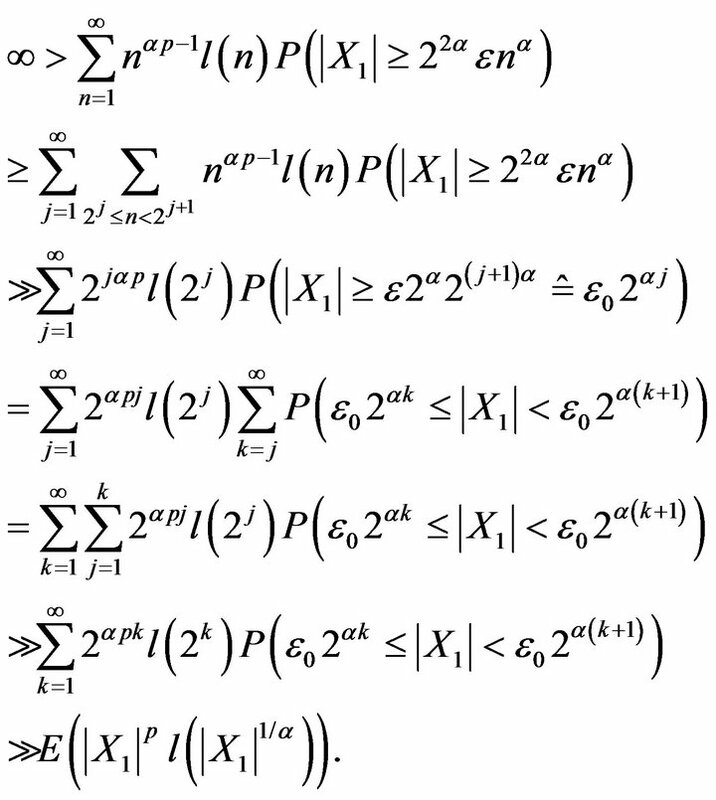 A sequence of random variables is said to be a -mixing sequence of random variables if there exists such that . Without loss of generality we may assume that is such that (see ). Here we give two examples of the practical application of - mixing. has the property that . 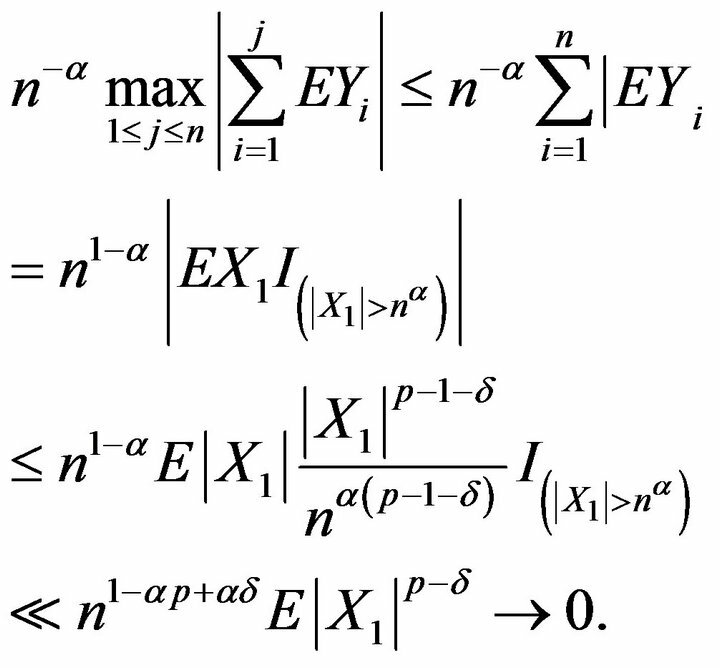 Therefore, instantaneous functions of such a sequence provides a class of examples for -mixing sequences. Example 1.2. 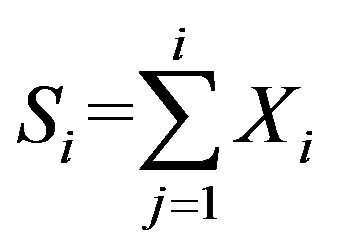 If has a bounded positive spectral density , i.e., for every t, then . Thus, is a -mixing sequence. -mixing is similar to -mixing, but both are quite different. is defined by (1.1) with index sets restricted to subsets S of and subsets of . On the other hand, -mixing sequence assume condition ，but -mixing sequence assume condition that there exists such that , from this point of view, -mixing is weaker than -mixing. A number of writers have studied -mixing sequences of random variables and a series of useful results have been established. 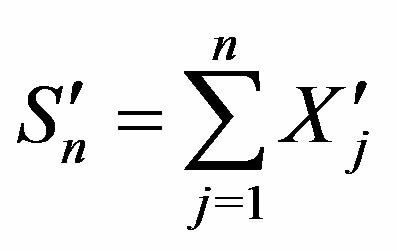 We refer to  for the central limit theorem [1,3], for moment inequalities and the strong law of large numbers [4-9], for almost sure convergence, and  for maximal inequalities and the invariance principle. 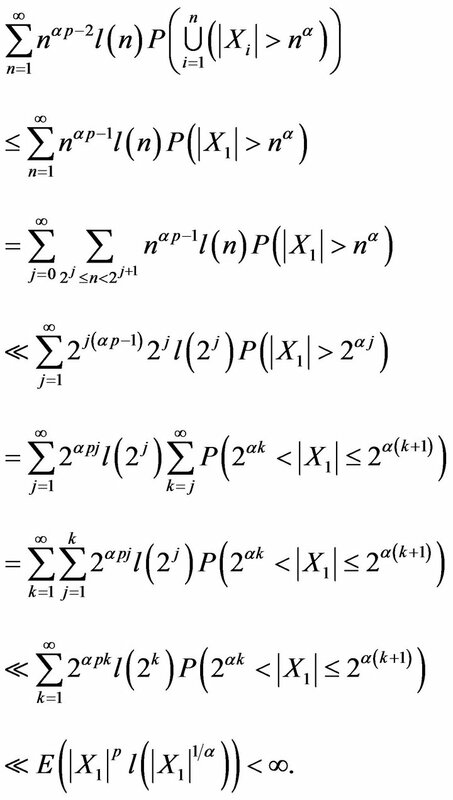 When these are compared with the corresponding results for sequences of independent random variables, there still remains much to be desired. 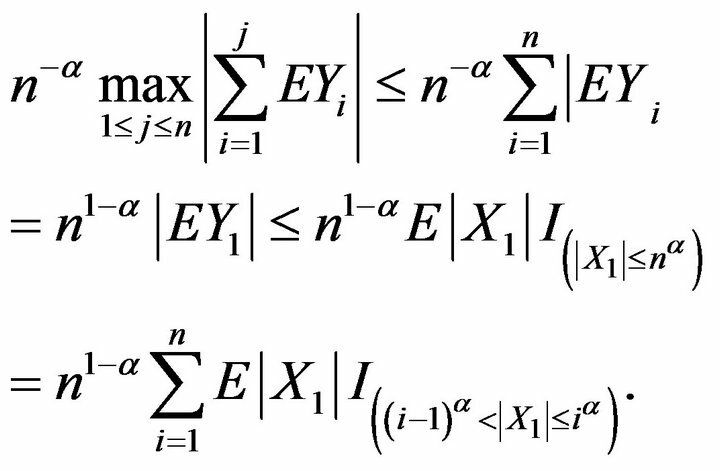 The main purpose of this paper is to study the complete convergence and weak law of large numbers of partial sums of -mixing sequences of random variables and try to obtain some new results. 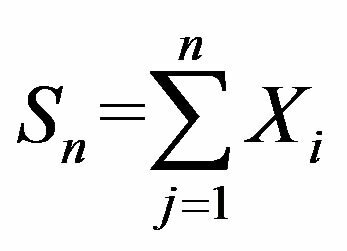 We establish the complete convergence theorems and the weak law of large numbers. Our results in this paper extend and improve the corresponding results of Feller  and Baum and Katz . Lemma 2.1 (, Lemma 1). Let be a slowly varying function at . Then i) . 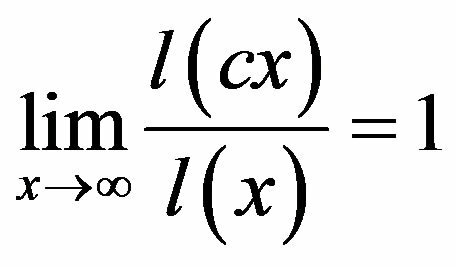 For we also have the following theorem under adding the condition that is a monotone nondecreasing function. Taking and respectively in Theorems 2.1 and 2.2 we can immediately obtain the following corollaries. Remark 2.1. When i.i.d., Corollary 2.5 becomes the Baum and Katz  complete convergence theorem. So Theorems 2.1 and 2.2 extend and improve the Baum and Katz complete convergence theorem from the i.i.d. case to -mixing sequences. Remark 2.2. Letting take various forms in Theorems 2.1 and 2.2, we can get a variety of pairs of equivalent statements, one involving a moment condition and the other involving a complete convergence condition. i) For , we have , and . 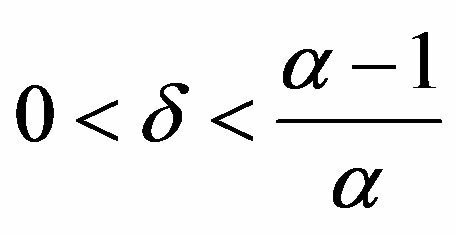 This completes the proof of Theorem 2.1. Hence (2.5) holds. 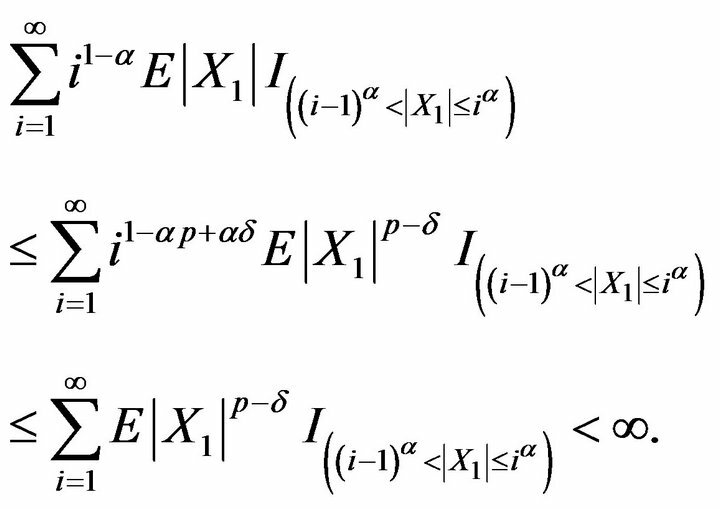 The rest of the proof is similar to the corresponding part of the proof of Theorem 2.1, so we omit it. Remark 3.1. When and i.i.d., then Theorem 3.1 is the weak law of large numbers (WLLN) due to Feller . 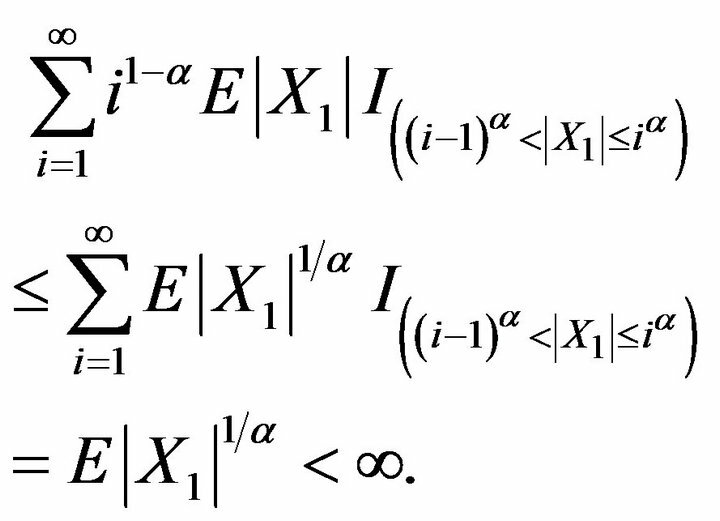 So, Theorem 3.1 extends the sufficient part of the Feller’s WLLN from the i.i.d. case to a -mixing setting. In this section, we give two examples to show our Theorems. The work is supported by the National Natural Science Foundation of China (11061012), project supported by Program to Sponsor Teams for Innovation in the Construction of Talent Highlands in Guangxi Institutions of Higher Learning ( 47), the Guangxi China Science Foundation (2012GXNSFAA053010), and the support program of Key Laboratory of Spatial Information and Geomatics (1103108-08). R. C. Bradley, “On the Spectral Density and Asymptotic Normality of Weakly Dependent Random Fields,” Journal of Theoretical Probability, Vol. 5, No. 2, 1992, pp. 355-373. Q. Y. Wu and Y. Y. Jiang, “Some Strong Limit Theorems for -Mixing Sequences of Random Variables,” Statistics & Probability Letters, Vol. 78, No. 8, 2008, pp. 1017-1023. 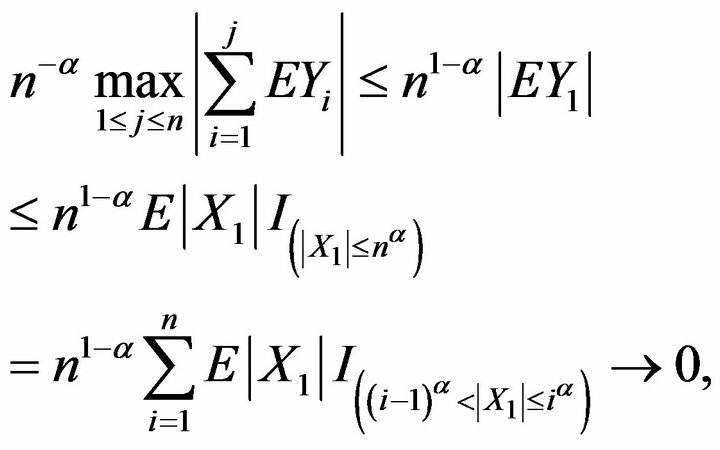 Q. Y. Wu and Y. Y. Jiang, “Chover-Type Laws of the K-Iterated Logarithm for -Mixing Sequences of Random Variables,” Journal of Mathematical Analysis and Applications, Vol. 366, No. 2, 2010, pp. 435-443. doi: 10.1016/j.jmaa.2009. M. Peligrad and A. 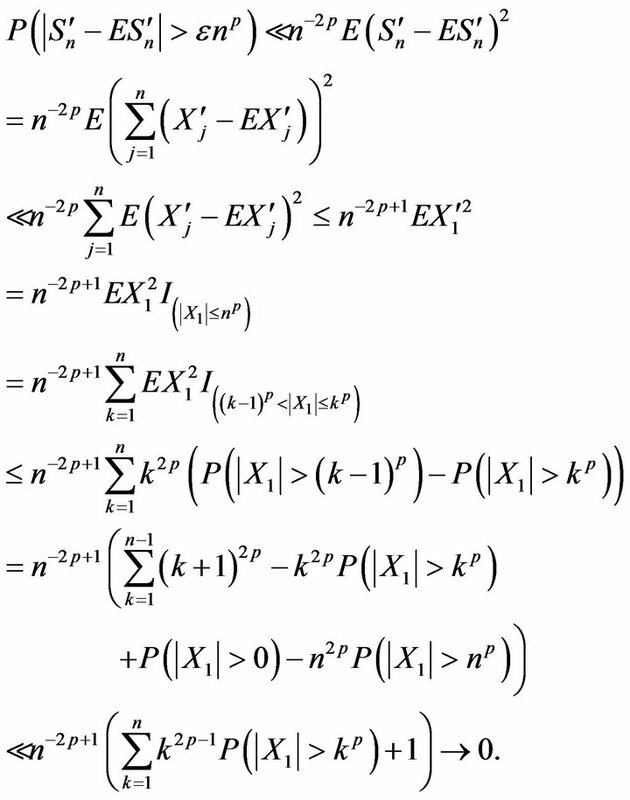 Gut, “Almost-Sure Results for a Class of Dependent Random Variables,” Journal of Theoretical Probability, Vol. 12, No. 1, 1999, pp. 87-104. 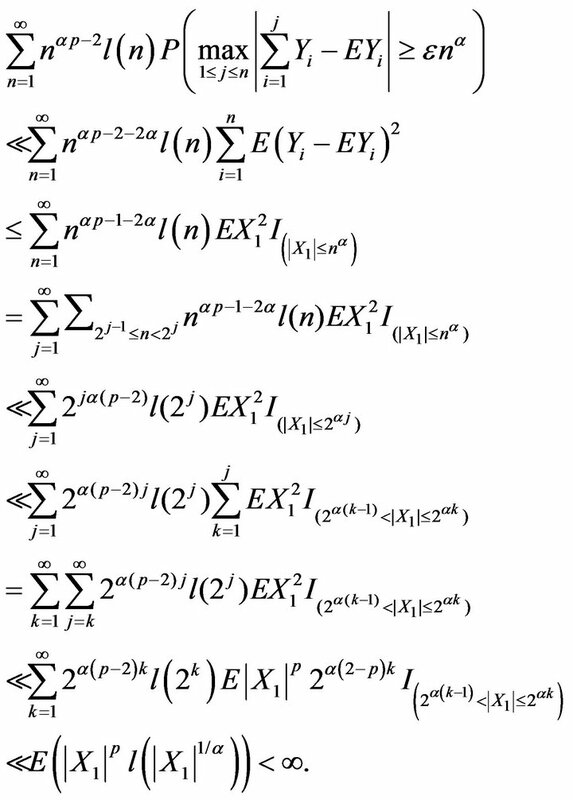 S. X. Gan, “Almost Sure Convergence for -Mixing Random Variable Sequences,” Statistics and Probability Letters, Vol. 67, 2004, pp. 289-298. 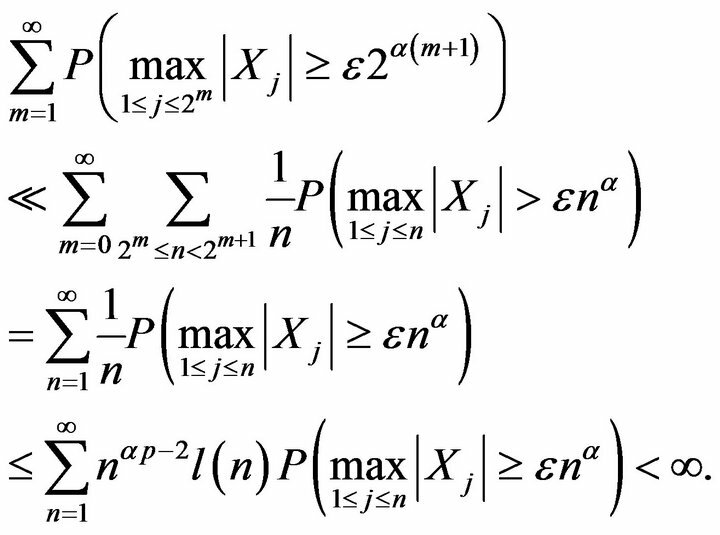 W. Feller, “A Limit Theorem for Random Variables with Infinite Moments,” American Journal of Mathematics, Vol. 68, 1946, pp. 257-262. L. E. Baum and M. Katz, “Convergence Rates in the Law of Large Numbers,” Transactions of the American Mathematical Society, Vol. 120, No. 1, 1965, pp. 108-123. Z. D. Bai and C. Su, “The Complete Convergence for Partial Sums of iid Random Variables,” Science in China, Series A, Vol. 5, 1985, pp. 309-412.